Actor Liam Hemsworth reportedly ended up in the hospital ahead of a press day for his new film Isn't It Romantic. On Sunday, Feb. 10, 2019, Liam Hemsworth's Isn't It Romantic co-star Rebel Wilson confirmed to Extra's Renee Bargh that he was hospitalized the night before. "Yes, he texted us this morning — he was in hospital overnight," Wilson shared, adding, "So hopefully he will be fine." Given his hospital visit, Hemsworth missed a press day for his new comedy, which also stars Priyanka Chopra and Adam Devine. As noted by Us Weekly, Hemsworth, 29, also missed out on the 61st Grammy Awards, where his wife, Miley Cyrus, performed alongside singer Shawn Mendes as well as her godmother and music legend Dolly Parton. Since Hemsworth apparently couldn't make it to the high-profile event, Cyrus, 26, instead walked the 2019 Grammys red carpet with her father, country music's Billy Ray Cyrus and Tish Cyrus. While we're not sure exactly what may be afflicting Liam Hemsworth, it's still possible that he'll attend the premiere of Isn't It Romantic on Monday, Feb. 11. Extra noted that Miley Cyrus previously said on Friday, Feb. 8 that she'd be heading to the movie's premiere with her husband. Hemsworth and Cyrus, who met while filming their 2010 movie The Last Song, married on Dec. 23, 2018, in a "small and intimate and rather spontaneous" wedding ceremony, as reported by Entertainment Tonight. While at the G'Day USA Los Angeles Gala on Jan. 26, 2019, Hemsworth opened up about his marriage to Cyrus, sharing with Extra, "It's all wonderful and I feel very lucky to be with her." He noted that things between Cyrus and him feel "the same but different," as the two had "been together for the better part of 10 years." 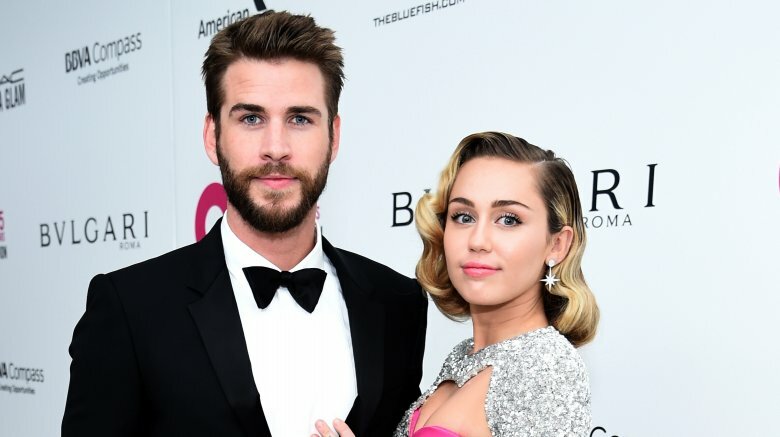 On Feb. 8, Hemsworth announced on Live With Kelly and Ryan that Cyrus had legally taken his last name after they tied the knot, saying that Cyrus was "Miley Ray Hemsworth now, actually." "She will still be obviously known as Miley Cyrus, but she took my name, which is great," he told hosts Kelly Ripa and Ryan Seacrest. "That was honestly one of the best things about it. I didn't ask her to take my name, but then she was like, 'No, of course I'm taking your name.'" Hemsworth's movie Isn't It Romantic follows the story of a woman named Natalie (played by Rebel Wilson) who finds herself stuck inside a romantic comedy (via IMDb). 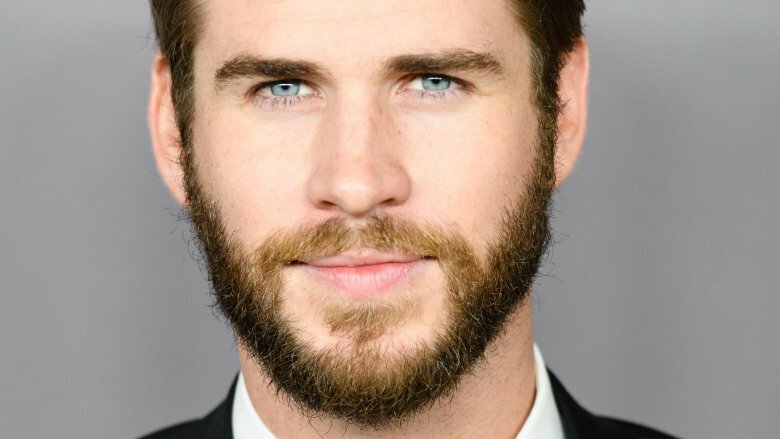 Liam Hemsworth portrays a Natalie's love interest, Blake. Speaking to BUILD Series on Feb. 8 with Wilson, Hemsworth shared some insight into how they filmed romantic scenes for the movie. "It's always good in-between takes to keep it nice and light, because it's always — when you do a kissing scene with someone that you've been working with — now all of a sudden you have to make physical contact with their lips, that's always a little nerve-wracking," he stated (via AOL). "You're doing it in front of a lot of people, but it was really fun. We kept it light and fun." Still, things can still get embarrassing while filming, as Wilson revealed that she had to have two of her toenails glued back on after a stunt. "I just admitted to Liam this morning something very embarrassing that happened to me in the scene where Liam comes out of the shower and I'm in bed," the 38-year-old said. "Um, two of my toenails had come off because of a stunt earlier in the week, and in between takes my makeup artist was supergluing them back onto my foot, because I then had to run out of the bed and jump on Liam, or whatever." Clearly filming intimate scenes can be super awkward. Fortunately, Hemsworth and Wilson appear to have nothing but respect for one another, as Wilson has sung the Hunger Games actor's praises. "I don't think I could've got anyone better," Wilson said of Hemsworth (via ABC News), calling him a "lovely guy" and "so funny." Isn't It Romantic hits theaters on Wednesday, Feb. 13. Hopefully, Hemsworth will be over whatever may be ailing him just in time for the movie's premiere. Feel better, Liam!